It's almost as if IKEA designed the Tarva dresser specifically for creative DIY types to transform. It's made of raw wood and has very little personality. But just wait until you see how Ashley transformed the Tarva into an unbelievably glamorous piece. We have a lot of thrift store finds in our home - how about you? Firstly because we can't walk away from a good deal when we see one! And secondly, I just love a simple challenge to see what I can do to breath new life into an old and neglected piece. Take for example this hot pink stool I found for $3! I actually didn't mind the color too much, but what I really loved about it was how solid it was and the fact that you don't see a lot of stools with only 3 legs. So, I had to have it! I decided to convert it to a small side table for our daughters room, but she can still use it as a stool if need be. 29th Avenue: A Colorful Master Bedroom Makeover Part II - The BIG Reveal! We bought the 29th Avenue house at the end of 2013 and have been slowly giving this 1920s bungalow a facelift, room by room: first the bathroom, then the office, and now the master bedroom! The previous owners had painted every room in, apparently, the darkest colors they could find. Considering our home has tiny rooms, even smaller windows, and we live in Cloud City, USA aka Portland, the dark and dismal vibes just weren't going to cut it. So, "Operation Cheer Up" was born. 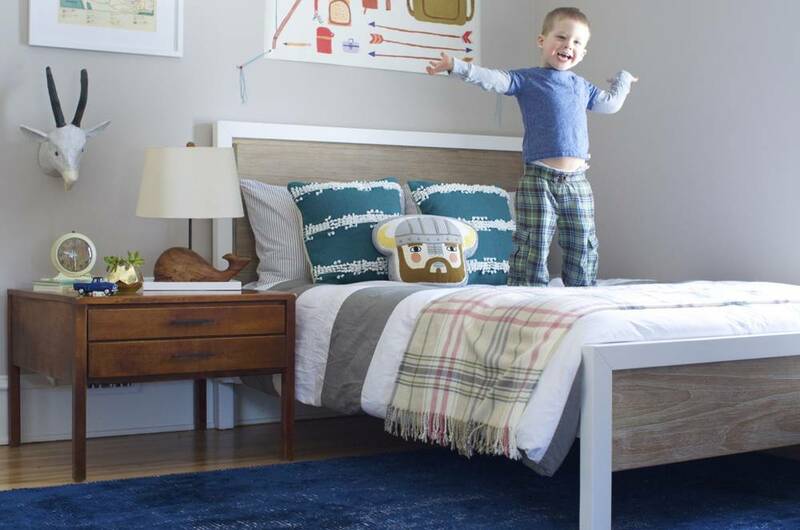 Yesterday, we told you all about our plans to make over our little boy's bedroom. Before we get to the big reveal, let's do a mini recap. We moved into the Curbly House when our son was two weeks old. Because we were insane people who purchased, gutted, moved into, and attempted to furnish and decorate a whole house with a brand new baby, his room was left looking fairly generic. We moved into the Curbly house when our little boy was two weeks old. It was a whirlwind, an epic frenzy of a time, and while we eventually put together a cozy nursery for our new little bundle, his nursery never developed a personality that reflected him. Reveal: Our Baby Boy's Nursery Makeover is Finished! When we found out we were having a baby boy, my vision of a neutral nursery of ivories and golds came to a crashing halt as I suddenly wanted the room to feel very boy like- with strong greens and dark blues and unmistakably boyish features. So I changed the natural taupe wallpaper to the hunter green safari, and charged on. When we moved into our first home about a year and a half ago, I had every intention of making our guest bedroom into a place for, well, guests. I tried to muster up the energy and enthusiasm to make this empty space into a place for people to come and visit us, but alas, no inspiration came and the room remained empty. And by empty, really what I mean is a place for all of Al's things to go and die. Water Damaged to Wonderful: A Chic Dresser Makeover!